Strong arms are awesome—they help you carry more groceries, more children, and they’ll give you some freedom in your yoga practice to experience some more advanced arm balances and other postures where your arms bear your weight. So how do you build up your arm strength using just yoga? Is it even possible to build up your arm strength without the use of weights and other equipment? The answer is yes, of course! Your body weight really does provide adequate resistance for you. It’s all about intelligently designing your practice to maximize your strength gains. If you want to build buff biceps and tough triceps, here are my top five yoga poses for stronger and toned arms. The classic series where you flow into Plank, down to Chaturanga, into Upward Facing Dog, and then push yourself into Downward Dog is one of the absolute best for building up the strength in your arms. You’ll be accessing every muscle in your arms and shoulder girdle as you practice this flow. It’s really no wonder that those Ashtangis are so powerful! I recommend flowing through at least five to 10 vinyasas during your practice each day. Many of the postures that people perceive to be good for building up arm strength, such as arm balances and other straight-arm postures, are actually not the most beneficial. For instance, hanging out in Crow may look like it’s going to work your arms, but that is actually more of a core strength posture—you’re relying upon the stacking of your arm joints to hold you up, rather than arm strength. 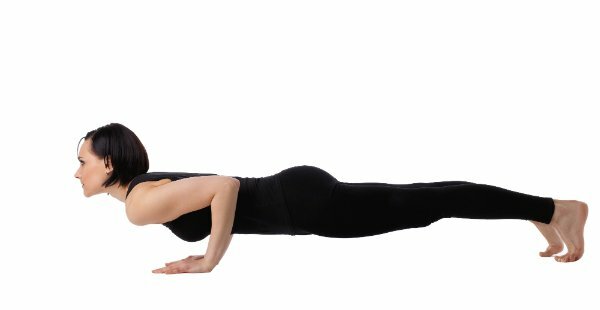 In Chaturanga, you are working with bent arms, and this causes the engagement to be much stronger. Holding this posture for a few breaths a couple of times during your practice will really target your triceps and your lower arm muscles. I love this pose for accessing arm strength because it works in a unique way when compared to most other postures. In Downward-Facing Dog, you’re pushing the floor away from you, attempting to offer more weight into your legs. You’re also engaging your arms to rotate them internally, which again accesses new muscles. Downward Dog, when practiced properly and regularly, will get into the smaller supporting muscles of your arms. This one usually gets a lot of groans when it is offered in a yoga class, but it is one of the best for arm strength. In a yogi push up, you will start in Plank position, placing your hands directly under your shoulders. From there, you will hug your elbows into your ribs, just like in Chaturanga. Be sure to really engage your core and keep buoyancy in your hips. Then, you will push yourself back up into Plank. This is a workout! Do five to 10 of these each practice. You can drop to your knees if it helps you maintain proper form. Focus on keeping your chest buoyant while you do this. The last pose I suggest for building up your arms is Plank Pose. You’ll be relying on the stacking of your arm bones for stability a little more than in the other postures I recommended, but you’ll also be working all the small supporting muscles in your chest, back, and shoulder girdle in this pose. All this will enhance your arm strength-building efforts. Make sure you are actively hugging your arm muscles in towards your arm bones in this posture rather than dumping all of your weight into your joints. Do these poses and sequences regularly, and watch your arms get firmer, more toned, and ultimately, stronger!